Reliable research on speech best encompasses an analysis of both the acoustics and the mechanics of speech. Scientists in the fields of dentistry, neurology, neuro-physiology, and phonetics have been searching for less work intensive, more useful technology for articulographic studies. Electromagnetic articulography (EMA) provides a solution to these problems in speech mechanics research. The movement itself is measured, graphed, and saved. 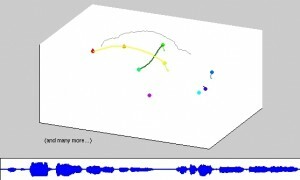 The connection between the fields of acoustic and mechanical speech research is made. Sensor placement is allowed at all positions and in all orientations within a 300 mm spherical measurement area. 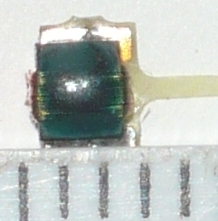 The unit allows measuring with high timing resolution. 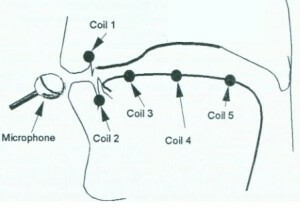 Small connector coils are positioned on and in the subjects mouth. Together with the accompanying software, the procedure from set up to measurement to data analysis is clear and allows the user to access otherwise unavailable information about tongue, mouth, palate, and jaw movement. Each of the transmitters produces an alternating magnetic field at different frequencies. 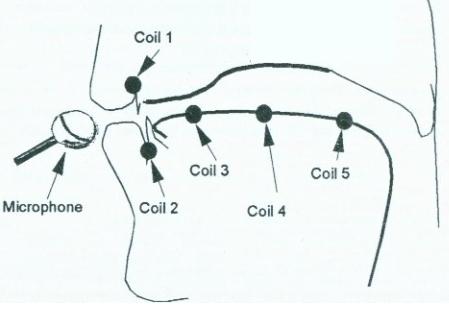 The alternating magnetic field induces an alternating current in the sensors, much like in a transformer, and allows one to obtain the distances of each sensor from the nine transmitters (AG501). It is then possible to calculate the XYZ co-ordinates as well as two angles and measure, store and display the positions of the sensors. 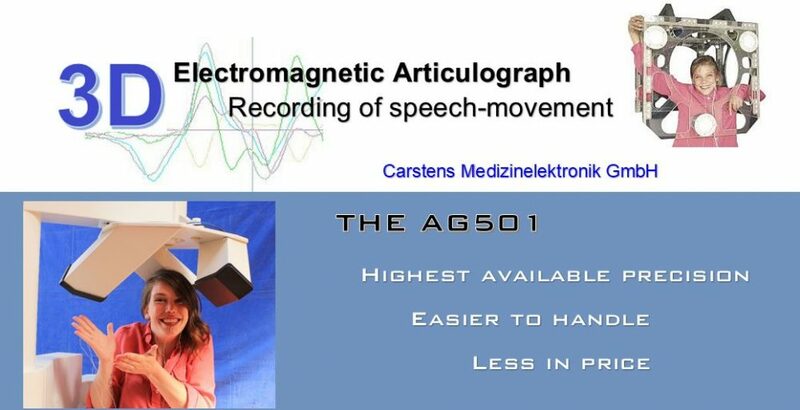 Below you find a video that shows what a typical recording session with the Articulograph AG500 looks like. It covers the device’s application from its calibration to the disinfection of the sensors. As an example of what can be examined with an Articulograph, you may read the 2013 EMA Publication on the “Assessment of speech production with dentures” by Patrizia Bonaventura, Ph.D. et al. Prof. Dr. M. Bertsch of the University of Music and Performing Arts Vienna (Austria) published in cooperation with PD Dr. P. Hoole of the LMU Munich (Germany) some fascinating movies using the Articulograph AG501 for visualizing tongue movements of trumpet and clarinet players in slow motion. The PROMPT Institute published in cooperation with the Oral Dynamics Laboratory and the University of Toronto a video on “Consistency of Tactile Prompting for Speech” using the AG501 for data acquisition. To demonstrate the extended measurement area, an example measurement was conducted at the EMA workshop at the ISSP 2014 in Cologne. Uli Szagun was singing a song while accompanying himself on the guitar. The lip movements of Uli singing and his finger movements on the fretboard of the guitar were recorded simultaneously.